The main Darfield branch of the Stables Family began around 1810, when John Stables (son of William born in Barnburgh in 1739) moved to Darfield with his wife Ann (née Tyas). Their descendants were mainly agricultural labourers and stone-masons/quarrymen initially but later turned to mining. 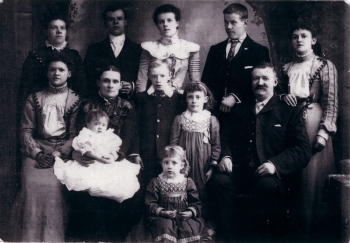 Around 1891, another branch of the Stables family moved into Darfield, when Oswald Stables took over the tenancy of The Rising Sun Inn, with his wife Annie Maria. They had previously run Inns in West Melton and Hoyland before settling in Darfield. They had a very large family of 17 children. A great deal of information is known about Oswald's branch of the Stables Family, who switched from mining into the licensed trade and became publicans. I have put this under the Wath section of the web-site, as they spent the majority of their lives in that area. This information about the Stables Innkeepers was gathered by Michael Chance and Victor Stables. One of John & Ann's descendants was John Stables (b. 1837, Darfield) who married Betsy Rossington (b. 1836, Carlton-le-Moorland, Lincolnshire). The photograph on the left shows Betsy and her daughter Mary Ann Stables (b. 1860, Darfield), who later married Charles Podmore. 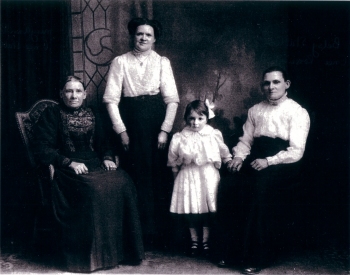 The people in the photograph are (Left-to-Right): Betsy Stables (née Rossington), Lilian Marshall (née Podmore), Edith Marshall and Mary Ann Podmore (née Stables). Permission to publish the pictures on this page was kindly given by Reg Dyson of Otley, who is a grandson of Mary Ann Stables. Isaac Stables moved to Wentworth and died suddenly whilst working in Stubbin Pit. For his biography and newspaper articles about his death click here.